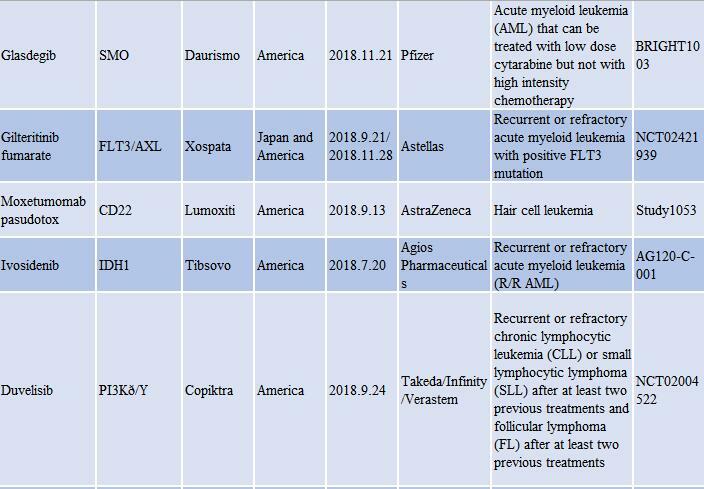 In 2018, from the approval of JNJ’s apalutamide in the United States on February 14 to that of larotrectinib on November 26, a total of 16 new tumor drugs were approved for the first time in the US, China and Japan. This article is going to review these drugs, four of which have already been approved in two countries/regions. 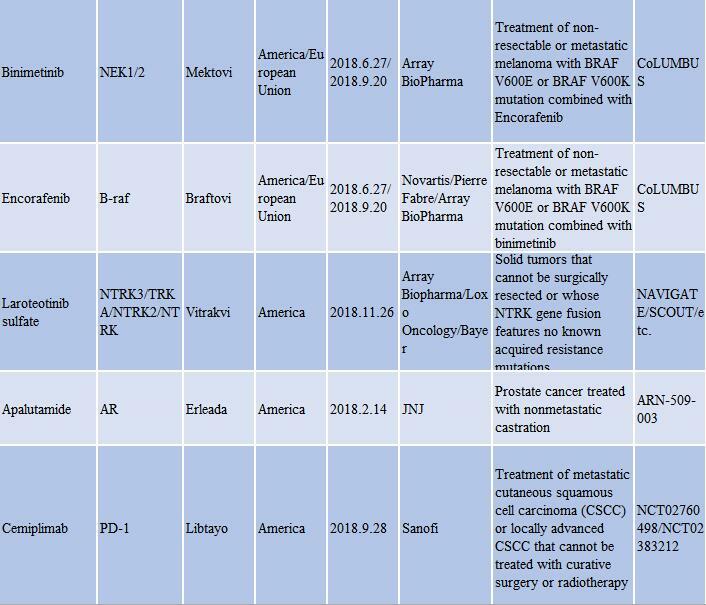 A review of the approved drugs shows that popular, unpopular and non-mainstream targets were all involved, including PD-1, MEK, HER, VEGFR, FGFR, PI3K, PARP, SMO, FLT3, CD22, IDH1. In addition, few drugs have come into the market with the same targets as Pd-1, PARP, IDH1 and SMO, suggesting bright market prospects. The targets represented by IDH1, SMO are of great significance to the follow-up research and development. In 2018, the Nobel Prize has once again induced culmination of tumor immunity. Thus, by the time cemiplimab was approved, there had been six approved PD-1/PD-L1 antibodies. Nevertheless, the tumor field remains dominated by small molecules, which occupy up to 75%. 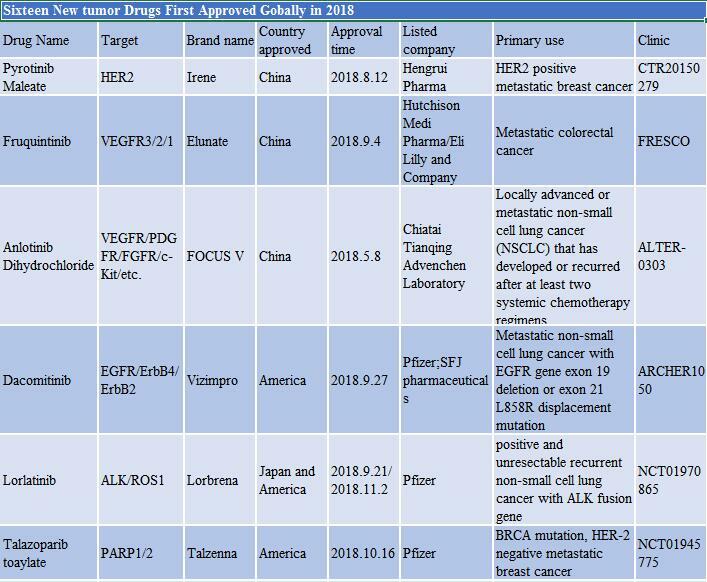 On the strength of the company, this year, Pfizer has deployed and listed its products for non-small cell lung cancer, breast cancer and leukemia, and it has four new drugs first approved. Array BioPharma is a powerful innovator, with three drugs among the first to enter the market for melanoma and capable of grabbing the market share from Loxo’s star drug, larotrectinib. Undoubtedly, JNJ is the winner because it has a popular drug abitron in the prostate cancer market, followed by another approved batch of potential varieties. In terms of the cancer type, leukaemia accounts for five in all, non-small cell lung cancer for three, and breast cancer for two, showing there’s still room for the market of these drugs. However, the indications for the approved drugs are so subdivided that some of them have become extra medications.